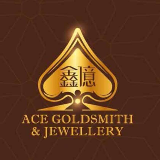 ACE Goldsmith & Jewellery is one of the top manufacturing company located in KL, founded by Yap Brothers. ACE Goldsmith & Jewellery knew that with their own crafting skill wasnt enough. therefore, they brought in the latest technology from overseas like 3D printers, Chain making Machine and etc. ACE Goldsmith & Jewellery is famously known from their top selling product, Gold Ball Bracelet. ACE Goldsmith & Jewellery continuously focuses to provide the best service to customers by offering best crafted gold jewelries provided with unreasonable return of goods policy.